There are a lot of rumors floating around right now about what is on the horizon for iPhones. First we heard about a number of potential prototypes in the works for the Apple iPhone 7, and now we're hearing that Apple might be looking at releasing the rumored iPhone 6c as soon as this coming February. The report cites various unnamed sources, including supposed Foxconn insiders, who have been working on the iPhone 6c. Apparently, the device would be the previously rumored 4-inch Apple device that had been in the works, and it would include a TouchID fingerprint scanner. But, being a "C" class Apple device, it wouldn't have all the best features, so 3D Touch might not be part of the package. 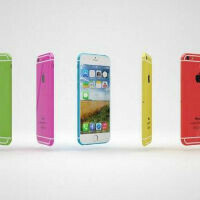 The iPhone 6c is also said to have a number of color options, just like the 5c and will be made out of metal. Because this is a "C" class device from Apple, that would mean a slightly lower price point, and the report claims somewhere in the $400-$500 range. However, this leads to the question of what Apple will do with the iPhone 6 and 5s, which currently sell for $550 and $450, respectively. When Apple introduced the iPhone 5c along with the 5s, it flat out stopped selling the iPhone 5 and the 5c slid into the mid-range spot in the lineup, while the iPhone 4s remained in the low-end spot. Given the rumored price, it would seem Apple might be considering keeping the iPhone 6 in the lineup in the $550 spot, but replacing the 5s with the 6c. If the rumors are to be believed, Apple will be announcing the iPhone 6c in January and releasing it in February. So, if the news is accurate, the rumors will likely only get more frequent from here on out. 4" screens are terrible on the eyes. When I even pick up my old iPhone 4 I still have, it feels like a little toy. IMO, 4.5/4.7 should be the smallest a phone should be now. anything smaller if you plan to read stuff is just terrible and I wear contacts. Even the graphics on games, and when using the device the display is so little that when you use it with your hands, it just blocks 40% of the display, at least in my case. Also pricing. Considering the hardware inside the present and last model, if this phone is actually made; it should cost above $400. I am betting they will liekly still be using iPhone 5S hardware inside it at most because they probably got stuck with a lot of them when the 6 came out. They probably dont expect sales of it to be higher than 20-30M at best so they probably have enough left over parts including 1.2/8MP cameras and the A7 CPU. Also consider, how cheap a 4" display has to be now. We are talking a phone which probably cost them $150 tops to make. So if it sells for $500 that is a complete ripoff for 3-4 year old hardware as far as specs. Oh and if they make it metal, it would appear they are following Samsung who has also started to use metal builds for mid/lower tiered devices. For people who just want an iconic iPhone, keeping the cost below $400USD, would make it also cheaper in other countries for people who just want an iPhone but can't budget it, considering their income is less than $400USD per month. lol that one made me chuckle too. How would you feel when all that brain vomit you just spread became completely untrue ? He said his iPhone 4 has a 4. Screen, what a liar. Anyone who's had one knows better than that lol. I spot so many lies of his, I just don't call him out on them. What's the use? In some posts he does try to be fair (I've noticed that much). But just like me - he's biased, I just don't know why trash a platform you care nothing about. At least he doesn't trash iOS users like all the other trolls and I can live with that. To me he lies too much. He doesn't attack iOS users, true, but too many lies. Or you could get a Z5c and have 4.6 inches in the size of a 4 inch iPhone. For that matter, by then there will be a Z7c as well . Honestly, Apple is by far the worst in design compared to all the other OEMs in the market now, so only their brand name is left to buy for. Bezzels do not inflict one hand work so much becaouse i need to reach the display, not to top of the phone, plus z5c is way more thiker, but if you dont have small hands its good one hand device, thats true. Bezels do not inflick one hand work? That couldn't be further from the truth. Considering physically the Z5 is almost a 1/2 an inche shorter in length, and 2mm smaller in width then the iPhone 6s. When a phone is both smaller in width and height, then physically it is easier to use in one handed scenarios. 100% a fact. As far as thickness is concerned you make it look like the Z5 is too thick to handle. The Z5 is only 1.8 mm thicker, yet it has a much larger battery then the iPhone 6s 1715mha battery. The Z5 has a 2700mha battery for its 1.8mm extra thickness. Anyone with a right frame of mind would gladly take an extra 1.8 mm for an extra 1000 mha battery. Side bezels do just like thiknes, the top and bottom one do not . I need to reach the whole screen + button, not all frames. I never denied that z5c is easyer to use with one hand than 6s. 5s is way, way easyer than both. Releasing the. Same month as the S6? What a way to add insult to injury. If it's going to replace the 5s, it will probably just use the A7 and same screen as the 5s. But be priced more than the 6. Lol crooks these Apple peeps are.